Founded in 1993, the Nashville Warburg Chapter is one of the ACG’s oldest chapters. The founding members consisted largely of the people who had organized or sponsored the 1992 ACG Young Leaders Conference – attorneys, judges, business people, and academics, all of whom had an interest in foreign affairs in general, or Germany in particular. 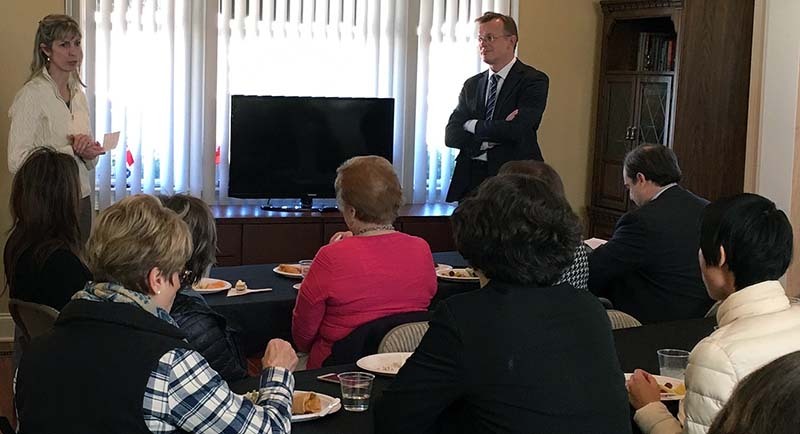 The Nashville Chapter partners with a number of other organizations including the Committee on Foreign Relations, the German American Chamber of Commerce, Sister Cities of Nashville, the German Department and Max Kade Institute of European Studies at Vanderbilt University, and Tennessee State University. Since its creation, the Nashville Chapter engages the German-American community by hosting several events each year. In 2017, the Chapter held discussions with Juliane Schäuble, United States Correspondent for Der Tagesspiegel; Torsten Schimanski, Director of Open Enrollment Training for the New Jersey Manufacturing Extension Program (NJMEP); Ambassador Thomas Matussek, Former Senior German Diplomat and Senior Advisor at Flint Global in Berlin; Christine Benz, D.B.A., Training Manager at TRUMPF Inc.; Dr. Angela Stanzel, Policy Fellow at the Asia and China Program of the European Council on Foreign Relations (ECFR); Max Grünig, President of the Ecologic Institute US; and Hans Kundnani, Senior Transatlantic Fellow at The German Marshall Fund of the United States. Douglas Berry is a member of the firm Miller & Martin PLLC. His practice concentrates on municipal law, zoning, eminent domain, and general commercial litigation. Mr. Berry was the City Attorney for Franklin, Tennessee, from 1989 through 2007 and is currently the Interim Town Attorney for Smyrna, Tennessee. He has represented many other Middle Tennessee cities, counties, and pubic utilities in litigation and non-litigation matters over the past 25 years. Mr. Berry was an ACG Young Leader in 1992.